Description: Priolos measure between 15 and 17cm from the tip of the bill to the end of the tail and weigh about 30g. 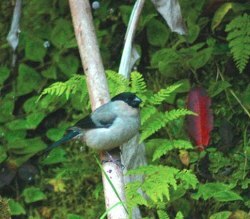 Medium-sized, plump, short-winged, long-tailed, dull coloured finch. Black cap and facial area, tail and wings. Grey lesser covert and greater covert wing-bar. Brown back. Grey nape and uppertail-coverts. Pinkish-brown underparts. Both sexes are identical. Pairs nest in Laurel forest between June and September. Voice: The contact call is a short, flute-like and melancholic whistle phew which is very distinctive. 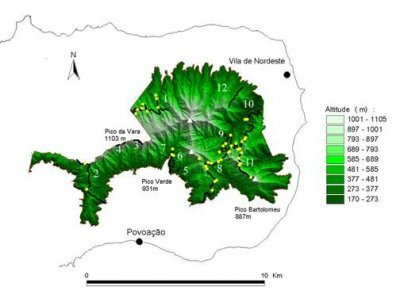 Distribution: The species is endemic to São Miguel Island in the Azores, more specifically to the mountain complex of Serra da Tronqueira situated to the east of this island, (shown in green on the following map), and includes the municipalities of Nordeste and Povoação. Its estimated population is approximately 775 individuals*, limited to only a few fragments of remaining native vegetation. It is the most threatened passerine bird in all Europe, and is listed as critically endangered. Fig. 2 - São Miguel island with the representation of the Special Protection Area (SPA) of Pico da Vara / Ribeira do Guilherme. Fig. 3 - Transects conducted for the annual census of the Priolo population numbered from 1-12, and bird detections during 2003 census marked as yellow points. May to September: (herbaceous seeds): Polygonum capitatum (Pinkhead Smartweed), Prunella vulgaris (Common Selfheal), Hypericum humifusum (Trailing St. Johnswort), Scrophularia auriculata (Shoreline Figwort), Luzula azorica (Azorean Woodrush) and Leontodon rigens (Hawkbit). AgoAugust to December: (fruit seeds): Vaccinium cylindraceum (Azorean Blueberry), Rubus sp. (Blackberry) and Leycesteria formosa (Himalayan Honeysuckle). November to March: (tree seeds and fern sori): Clethra arborea (Madeiran Sweetpepperbush), Woodwardia radicans (Rooting Chainfern) and Culcita macrocarpa (Tree Fern). 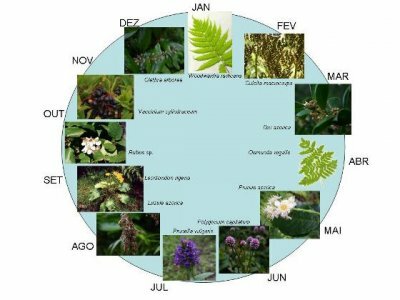 March to May: (flower buds, fronds and sporangia of ferns and vegetative terms of mosses): Ilex azorica (Azorean Holly), Prunus azorica (Azorean Plum), Osmunda regalis (Royal Fern), Pteridium aquilinum (Western Brackenfern) and Polytrichum sp. (Hair-Cap Moss). May to July: invertebrates (Hemiptera) enclosed in leaves of Laurus azorica (Azorean Sweet Bay). Fig. 4 - Annual feeding cycle of the Priolo. Conservation status: The Priolo is a protected species according to the European Directive on Birds and it is included in various lists of threatened animals, both at national level (Red Book of Vertebrates in Portugal) and at international level (IUCN Red List of Threatened Animals). For this reason the Special Protected Area, (SPA) of Pico da Vara / Ribeira do Guilherme, (a Natura 2000 site), was created, which includes all of the distribution area of this species, with the main purpose of its protection and conservation. BirdLife International considers the Priolo as a “critically endangered” species. * Ceia, R. 2008. Monitorização da população de Priolo. Relatório da acção F6 do Projecto LIFE Priolo. Sociedade Portuguesa para o Estudo das Aves, Lisboa.